Achieve natural, long-lasting hold without ‘cementing’ hair into a crispy, rigid, un-brushable texture with the Color WOW Cult Favorite Firm + Flexible Hairspray; a weightless, rapidly-drying styling spray that delivers a strong but flexible hold to all hair types without leaving ‘helmet head’ or any crunchiness. 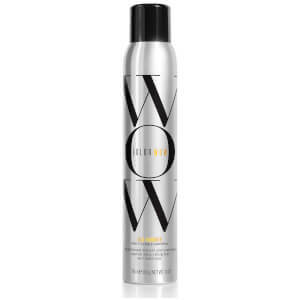 Formulated without the ingredients found in other hairsprays that darken hair or give locks a yellowy tinge, the reparative hairspray contains hydrolysed Keratin to strengthen fragile colour-treated strands, hydrolysed Silk to fill and smooth hair’s surface and UV filters for colour protection. Allowing hair to move naturally, the hairspray leaves locks comb-able, brush-able and shape-able without depositing flaky residues. Shake well. Spray from about 10 inches away.